The night before I wrote this article, I had a rather interesting experience that made me think about the difference between inspiration and rip-offs again. This was mostly because I happened to watch two episodes from season three of “Sliders” called ‘The Dream Masters’ and ‘Desert Storm’. Both of these episodes have been inspired by different movies. ‘The Dream Masters’ is a genuinely creepy horror-themed episode that has clearly been inspired by the “Nightmare On Elm Street” films and ‘Desert Storm’ has clearly been inspired by the “Mad Max” films. This is a screenshot from the episode “The Dream Masters” from season three (1996/7) of “Sliders”. As you can see, it takes some inspiration from ‘Nightmare On Elm Street’. This is a screenshot from the episode “Desert Storm” from season three (1996/7) of “Sliders”. As you can see, it takes some inspiration from ‘Mad Max’ (and this is even referenced once in the episode’s dialogue too). However, both episodes are also at least mildly good examples of how to take inspiration well. Although both episodes take fairly heavy visual and stylistic inspiration from their respective films, they also add a lot of original stuff too. For example, the horror in “The Dream Masters” doesn’t just come from the nightmare scenes but from the fact that a small group of people with magical powers wield an enormous amount of power over the world (a horror further increased when one of these people takes a rather stalker-like interest in one of the main characters). Likewise, “Desert Storm” also includes quite a lot of New Age-themed stuff too. Yes, the horror in “The Dream Masters” doesn’t come from one monster but from a secret society of evil magicians who wield absolute power. Likewise, note the use of scary red/blue lighting to signify that they’re the villains. Likewise, the story in “Desert Storm” also includes a lot of New Age-y stuff, like magical crystals and psychic visions. But, although these two episodes still tell original stories, they still almost fall into the trap of being “oh my god, this is just like…” rather than “hmm… this seems to be inspired by..“. In other words, their inspirations are a bit too obvious, even though they still avoid straying into the realm of plagiarism. But, how do you avoid this in the things that you create? The simple answer is to have lots of inspirations. The more inspirations you have, the less obvious each individual inspiration will be and the more “original” your work will be. Although the original inspiration was the old “Fighting Fantasy“/”Choose Your Own Adventure” books I read when I was a child (Steve Jackson’s “House Of Hell” especially), my interactive novel is distinctively different from these for several reasons. [CLICK FOR LARGER IMAGE]. This was a promotional poster I made for “Acolyte!” in 2015 which shows off some of the story’s illustrations. In addition to this, it also included a few other influences such as the classic computer game “Blood“, the horror fiction of H.P.Lovecraft, classic Monty Python, a “Doom II” mod called “Reelism Gold“, classic British sci-fi/fantasy comic fiction (eg: Terry Pratchett, Douglas Adams etc..), a slight satire on occultism (eg: “ancient orders” that were started in the 20th century), “The Devil Rides Out” by Dennis Wheatley, and the hilariously melodramatic 1960s film adaptation of it. Thanks to the wider mixture of inspirations, the interactive novella manages to be it’s own thing rather than a rip-off of any one particular thing. So, the more inspirations you have, the lower the risk of producing a plagiaristic “rip-off” (eg: almost a direct copy) of something else will be. Yes, I know that I’m breaking my “don’t blog about blogging” rule for at least the twenty-seventh time, but – as always- I have a good reason for doing so. Today, I’ll be looking at what to do if you start working on a new creative project, when you’re already creating and posting things online on a regular basis. I’ve dealt with this subject a few times, like during the five days that I spent writing an interactive horror/comedy story called “Acolyte!” in late September/ early October and I thought that I could offer two useful tips. 1) Efficiency: Back when I was writing “Acolyte!”, I didn’t have as much time or energy to spare for my usual daily articles and art posts. But, although I had a fairly large buffer of both articles and paintings, I didn’t really want to let this dwindle too much. So, instead, I worked out ways to spend less time and energy making art and writing articles. This is why, for example, some of my articles from earlier this month (yes, my article buffer is several months long) feature recycled title art. Believe it or not, creating and editing the little title graphics at the top of each of these posts can sometimes take up to half of the time it takes me to write a blog post. So, I was able to save time during those five days by just re-editing some of my existing title graphics using MS Paint. Likewise, many of the articles that I wrote during those five days were either fairly short or they were fairly rambling. I’ll talk more about how I wrote those articles later, but they were articles that were easier and/or quicker to write than most of my articles are. As for my daily art posts, I’d fortunately started a series of minimalist limited palette paintings (which were posted here in January) before I’d started writing “Acolyte!”. As such, it was fairly easy for me to continue making these paintings, albeit with less background detail, when I was writing “Acolyte!”. 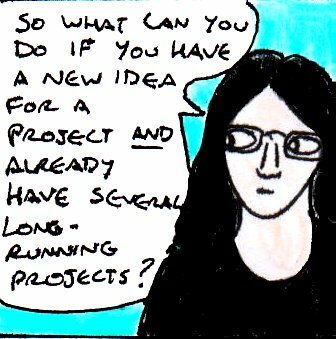 I guess that what I’m trying to say here is that, you need to find ways to spend a minimal amount of time and effort on your pre-existing projects whilst still working on your main project. If you can come up with ways to create filler content, then this can also be useful too. Although this might seem like a lot of extra effort, it’ll help stop you losing momentum on your pre-existing projects. This means that, once you’ve finished your new project, you can get straight back to working on your old projects again with a minimum of disruption. 2) Similarity: Back when I was writing “Acolyte!”, almost all of the blog articles that I wrote were about interactive fiction. Likewise, most of the art that I made during this time was related to the horror genre too. Why did I do this? Well, it was both to allow me to write articles and make art quickly, but also to prevent me from losing focus on the horror/comedy interactive story that I was writing at the time. Since I was devoting a lot of my mental energy to writing interactive fiction and coming up with horror-based ideas, making sure that all of my other projects (eg: these articles and my daily art posts) were as closely related to these topics as possible helped me out a lot. Since I didn’t have to think about any other topics, I could switch between writing daily blog posts, making art and working on “Acolyte!” fairly quickly. The lessons that I’d learnt from writing interactive fiction earlier that day could easily be turned into blog articles and, since I was already daydreaming a lot about the horror genre, it wasn’t too difficult to come up with ideas for horror-themed paintings. So, if you’re working on a new project then, if possible, try to make your pre-existing projects as similar to it as you can get away with. Not only will this make you more inspired, but it’ll mean that you’ll be able to jump between projects a lot more quickly too. As regular readers of this site probably know, I have a fairly short attention span when it comes to creating things. This currently means that I currently can’t spend more than 3-5 days working on a single comic project, more than 2-3 hours working on a single painting and it also means that I consider novella-length pieces of fiction to be “long” writing projects. 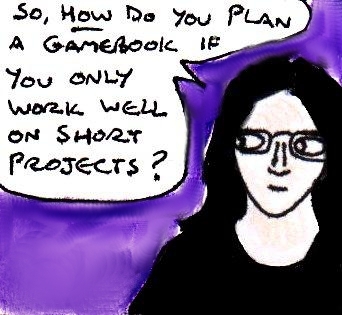 I also hardly ever pre-plan comics, paintings and writing projects to any large extent too. Yet, last October, I was able to make a 51-page interactive online gamebook called “Acolyte!” in the space of about five days or so. Yes, this gamebook is only between one sixth and one eighth the length of traditional print gamebooks, but given the level of complexity and planning involved in making a gamebook, I’m surprised that I was actually able to complete it. After all, back in 2013, I’d tried to write a sci-fi gamebook and I’d given up fairly quickly because of the sheer level of planning and amount of writing involved. 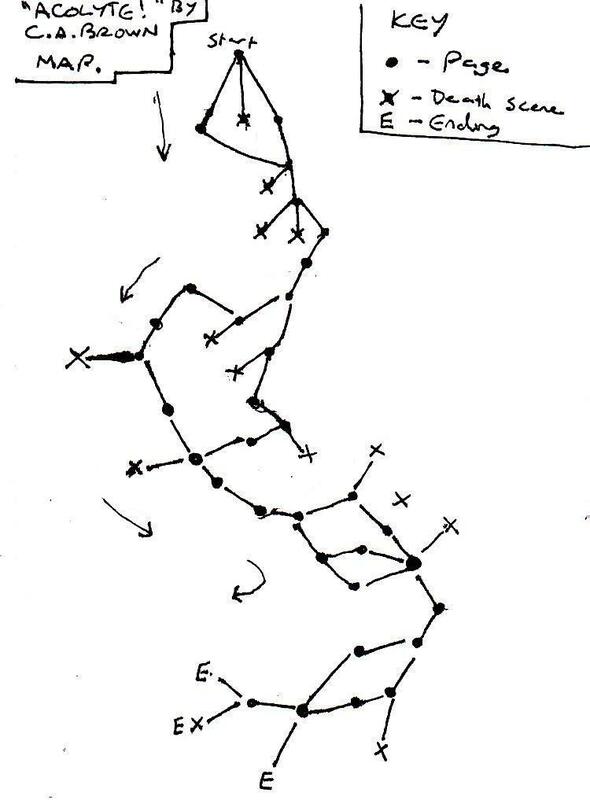 [CLICK FOR LARGER IMAGE] Dots signify pages, “X” signifies a death/failure scene and “E” signifies an ending. Instead of planning out one large and unwieldily chart, I split it up into five smaller segments. Most of these segments only end on one point (to make starting the next segment a lot easier). In other words, instead of planning one large gamebook, I planned out five shorter and more manageable self-contained gamebooks which happened to be linked together. [CLICK FOR LARGER IMAGE] As you can see, the map has been split into five easier and more manageable parts, albeit at the cost of making the story slightly more linear. 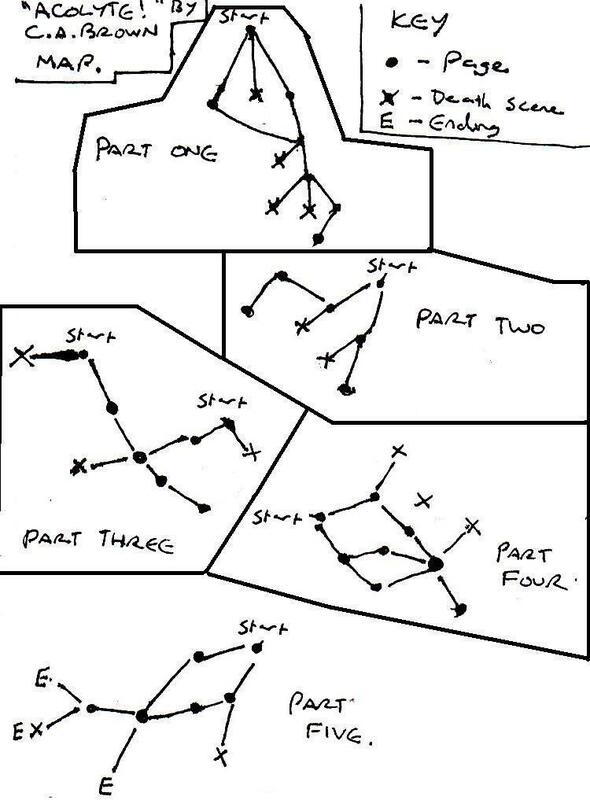 As I said earlier, this technique comes at the cost of making your gamebook slightly more linear, but it can be an excellent way to actually plan out a gamebook if you’ve got a short creative attention span. In case you missed the announcement earlier this month, I’ve written an interactive comedy horror story which can be read for free here. It’s kind of like those old gamebooks that you might have played back in the 1990s, but it’s online… and, unlike in the 90s, you don’t need a dial-up modem, dice rolls, stat sheets or anything like that. – The Keeper Of Darkblade Manor’s Historic Dungeons. 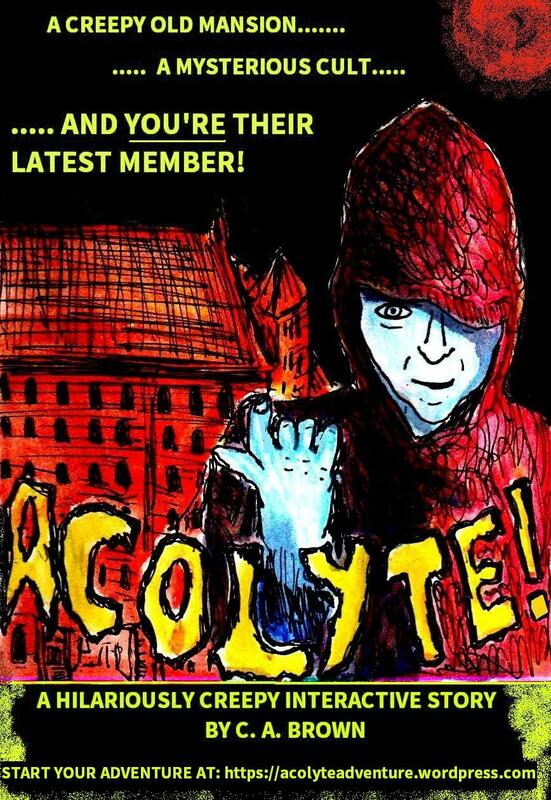 It’s a free online interactive horror/comedy story called “Acolyte!“. If you remember playing “Choose Your Own Aventure”, “Fighting Fantasy” and/or “Give Yourself Goosebumps” gamebooks when you were a kid, you’ll feel right at home here. Although I should warn you, this gamebook is a lot more cynical (and challenging) than the ones you played back in the 90s. In fact, it’s pretty much a parody of these books. If you want to jump right in, then you can start right here. If you get stuck, then there are two (two!) walkthroughs here.